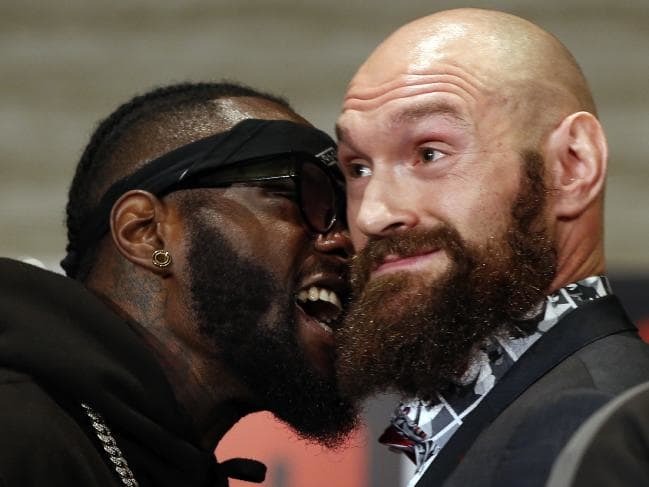 Tyson Fury and Deontay Wilder clashed on stage during a heated exchange at the final press conference to promote their heavyweight title fight at Los Angeles’ Staples Center this Saturday night. Reigning WBC heavyweight champion Wilder 40-0 (39) said Fury had had his time when he defeated Wladimir Klitschko for the IBF, WBA and WBO heavyweight titles three years ago before walking away from the sport until the middle of this year. The 33-year-old Bronze Bomber insisted the fight will not go the distance. The bout will be Fury’s third fight back since his two-and-a-half layoff to deal with depression and substance abuse issues. He stopped Albanian cruiserweight Sefer Seferi in four uninspiring rounds in June before boxing his way to victory in a 10-round fight against Italian Fringe contender Francisco Pianeta in August. “I don’t remember a training camp going any better than this one has gone,” said Fury 27-0 (19). “I am injury free. Sparring went fantastic – no complaints, no arguments, no marks on this beautiful face. But the 30-year-old self-styled ‘Gypsy King’ admitted victory would be a challenge for him. “It won’t be straightforward. Wilder has all the momentum,” he said. “He’s coming off seven fights since 2015 when I stopped. I’ve only had two, so he’s match fit.